While HDV and the move to HD have produced some truly amazing cameras— even in the consumer arena— compared to what was available for many tens of thousands of dollars just 10 years ago, those of us who regularly produce live shows are facing a new hurdle: expensive HD switchers. As the technical director and engineer for Flavors of America since the mid-1990s and, more recently, Healthy Flavors–two cooking shows that are broadcast nationally on PBS stations and on the Comcast cable network–I’ve used numerous video mixers over the years. Now, as we eye the move to HD, we are looking to upgrade our mixer. At the same price points as decent SD mixers, I find the choices are nonexistent. My current digital SD mixer cost me less than $5,000, and it has paid for itself over the years. I use it on numerous productions- with up to four cameras; and I don’t always use the FireWire inputs. Most often, the cameras used are broadcast-quality Sony DSR-570Ws with 6-pin FireWire out. The images we see on the master tape are as good as the ISO tapes shot in-camera. So this inexpensive mixer capably handles cameras that cost several times what the mixer costs. I recently had a chance to play with Datavideo’s inexpensive, SD-only SE-500, which mixes four channels of video, but it does not have a component or FireWire. However, it does offer a great feature: an internal quad-split preview that allows you to see all four inputs on one monitor, greatly simplifying setup. It also integrates a basic audio mixer, built-in frame sync, and tally light control—all for less than $2,000. This is quite a spiffy little mixer! Now that quality HD camcorders that cost less than $10,000 are plentiful— including several that can be genlocked to a house sync— I’ve been searching for an HD replacement for my current video mixer. But trying to find a HD video mixer that doesn’t break the bank has proven to be quite a challenge. One especially interesting twist is that many very inexpensive consumer and prosumer HD camcorders feature an uncompressed, full-HD HDMI output. The only product I have seen to use that like a professional video mixer is the Intensity card from Blackmagic Design. Amazingly, this little card costs only $249. Couple two cards together and use the free On-Air software as your 2-source video mixer at full HD, uncompressed. You can really make some pretty pictures this way. The problem is that the software is Mac-only and requires a $3,950 computer to house the $249 cards. Also, in spite of the Mac’s capability to house four PCI cards, the software is limited to two inputs. So this solution falls far short. The next step up would be something like Roland’s EDIROL V-440HD (street price $12,000), which handles four HD sources and four SD sources. It can also be used as an independent SD mixer or HD/RGB mixer. It handles different aspect ratios (16:9 or 4:3) and has video effects like PiP and transitions, plus two keyers. This sort of capability comes at a cost more than triple that of Canon’s XH A1 camcorder. Starting at about the same price (MSRP $11,000), another option would be Panasonic’s recently announced AV-HS400N, which handles up to eight SD or HD inputs. This more traditionally designed mixer only comes ready to handle four inputs and accepts optional boards (at around $1,700 each) that add two inputs at a time. By the time you get done outfitting this mixer as you need, it’s considerably more expensive. However, it does feature one very impressive, cost-effective feature: the built-in MultiViewer can output four, six, or 10 images from different sources to a single high-resolution display, eliminating the need for multiple HD source and preview monitors. Similar capability from Miranda Technologies’ products would cost you more than the Panasonic mixer itself. As functionally similar as Datavideo’s $2,000 SE-500 and Panasonic’s $11,000 HS400N are with video mixing and preview “multiviewing,” the core issue is that HD mixing still remains several times the cost of HD camcorders with full-resolution HD-SDI or HDMI outputs. This is quite a change from very capable analog SD mixers being available at a fraction of the camcorder’s cost. Another alternative would be to adapt something from a completely different arena: presentation switchers from companies like Analog Way. 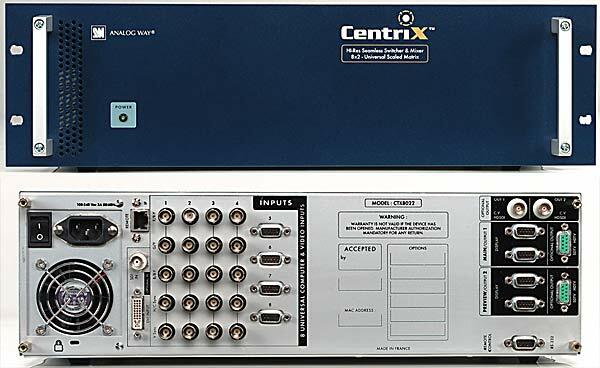 Its CENTRIX (street price $8,000) video mixer features dual scalars (what we call Frame Sync) and can handle eight inputs of anything up to UXGA, including HD (but not 24p); internal keyers and frame stores add to the functionality. But you’ll need to add external interfaces, like a keypad (the CENTRIX is a faceless box), a computer to adjust the settings, and devices to convert all the VGA and DVI ins and outs to your video gear. In many respects, that’s far more trouble than its worth. All of this leaves you without a viable option for an HD video mixer if your budget doesn’t exceed what you could expect to pay for an SD-only mixer with comparable functionality. In due time, we can expect prices to drop. But until then, the affordable “prosumer” HD video mixer remains the next hurdle for live HD production. Focus Enhancements also have a couple of HD switchers. I remember covering them on video at the 2007 NAB conference. I couldn’t agree more — it amazes me that no one has made a more affordable HD mixer yet. I would love to hear some hardware makers (or folks with the electronics knowledge) chime in on the subject. I would really like to see some video mixers for the consumer market. NOBODY is offering a 4 channel video mixer off the shelf for home users. It would be nice and very much in demand especially with the HD attention lately. It wouldn’t have to offer anything near a professional rig would bring but just something basic. 4 channel mixer w/various i/o’s and simple transition or blend. Well I am glad I am not the only one out there searching for an HD mixer. Now that YouTube is in HD at 1280X720p and videos are listing in search engine result pages, the demand for a good HD mixer should be HUGE. I have tried VJ software like Modul8 – but found that they they say that they support HD video , but they do not support HDV ?? WTF? Anyone having any luck with a compositing video software solution that supports HD and Audio? Looks like Focus Enhancements has dropped their video mixer product line completely.